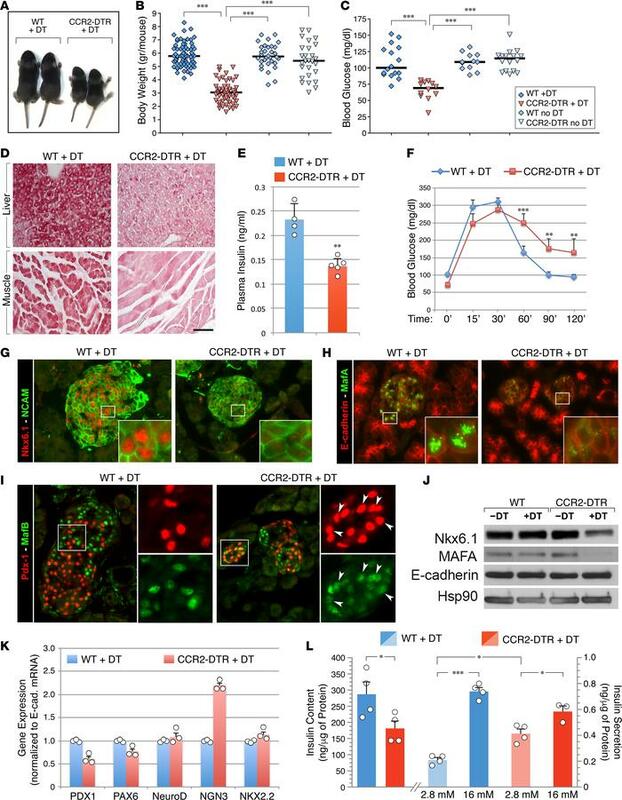 Effects of CCR2+ cell depletion on body size and glycemic homeostatic control. (A) Decreased body size of DT-treated CCR2DTR/+ mice compared with WT littermates at P10. (B) Body weight of untreated or DT-treated CCR2DTR/+ mice and WT littermates at P10 (n = 27–71). (C) Mild basal hypoglycemia detected in DT-treated CCR2DTR/+ mice at P10 (n = 9–16). (D) Tissue sections of liver and skeletal muscle stained by periodic acid–Schiff, showing decreased glycogen storages in DT-treated CCR2DTR/+ P10 pups. Scale bar: 50 μm. Representative of n = 4. (E and F) Basal plasma insulin (E) (n = 4–5) and glucose tolerance tests (F) (n = 7–9) in P10 DT-treated CCR2DTR/+ mice and WT littermates. **P < 0.01, ***P < 0.001, 1-way ANOVA nonparametric test, followed by Bonferroni post-hoc test. (G–I) Pancreatic sections from P10 DT-treated WT and CCR2DTR/+ mice stained for the islet markers NCAM and NKX6.1 (G); islet transcription factor MafA and E-cadherin (H); and islet transcription factors PDX1 and MafB (I). Insets in G and H show NKX6.1 and MafA localization to the islets’ nuclei, whereas insets in I show aberrant persistence of MafB in PDX+ cells in DT-treated CCR2DTR/+ mice (arrowheads). Representative of at least n = 6 per group. (J) Western blotting of NKX6.1 and MafA expressed in total protein lysates of P10 pancreatic islets. Membranes were stripped and reprobed for E-cadherin and Hsp90 as loading controls (n = 3). (K) Representative qPCR analysis of islet transcription factors mRNAs in pancreatic islets of DT-treated WT and CCR2DTR/+ mice at P10 (n = 2) (mean ± SD of triplicates). (L) Insulin content and glucose-stimulated insulin secretion of islets isolated from DT-treated WT and CCR2DTR/+ mice at P10 (n = 3–4). *P < 0.05, ***P < 0.001 by 2-tailed Student’s t test used for insulin content and by 1-way ANOVA nonparametric test for multiple comparisons of insulin secretion.